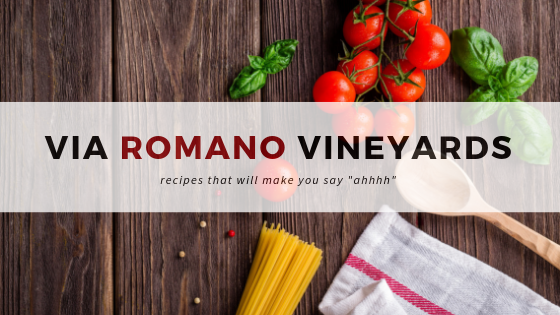 Welcome to the Via Romano Vineyards Recipe Blog. We post recipes of dishes from our home to yours, that also pair perfectly with our wines! Preheat the oven to 350F and add the olive oil to a roasting tin. This was our first year participating in Nevada Day Weekend with our El Dorado winery partners, and we had a great time welcoming visitors from all over Nevada in to the Tasting Room. We made a lot of new Nevadan friends, and were happy to see those we already knew, some of whom visited more than once over the course of the weekend! To make it extra special, Leanne made a batch of homemade Tuscan Soup each day, which we served with fresh focaccia, to pair with our wines. One of the first new things people noticed when they walked in the door was how amazing our Tasting Room smelled because of the aromatic soup. It was like walking in to an Italian kitchen. So many people asked for the recipe that we knew we had to share it. We recommend making a full batch, because it's addictive, and now that the cold weather is creeping in we basically want to eat it every day! Sauté carrots, celery, onion, garlic and fennel in butter and olive oil. When veggies are clear, salt and pepper to taste and add chopped rosemary. Simmer 5 minutes and then add wine. Simmer 10 minutes and then add all remaining veggies (except Kale), along with the broth and water. Cook on medium for 30-45 minutes and then simmer until time to serve. Add kale a few minutes before serving. Serve with focaccia and a glass of Via Romano Vineyards Vermentino, or your favorite wine from Via Romano Vineyards. Jon and I are so excited to show off what we have accomplished in such a short time. Our winery is set to open in the next few weeks! We are fine tuning the tasting room and preparing to pour you a taste of our handcrafted wines. We have worked very hard to make our winery a place where you, our customer, feels welcome. Bring your family, as we are a family run winery. You may see our granddaughter, Lileana, tidying up the tasting room or our sons Josh and Kelsey making Sidre in the spring. Our daughter Aubrey and daughter-in-law (to be) will be working behind the bar pouring you one of our fantastic wines while Papa Romano (my dad) and my mom will be visiting with guests in our tasting room.